A lightweight, full coverage foundation. 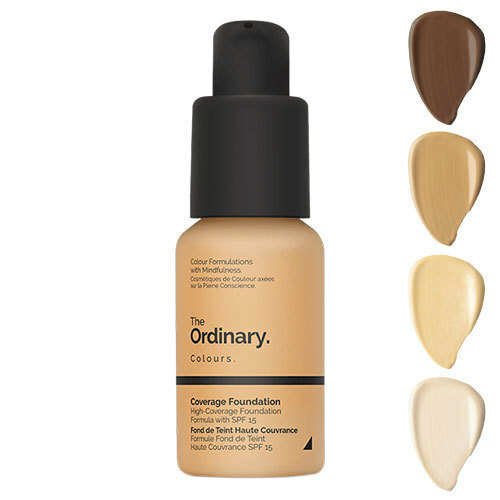 Available in 21 shades, Coverage Foundation SPF 15 is suitable for all skin tones. Rich and buildable, this cream like texture smooths seamlessly over skin to even, conceal and disguise fine lines and wrinkles. Very Fair 1.0N – Very fair neutral. Very Fair 1.0NS – Very fair neutral with silver highlights. Very Fair 1.0P – Very fair pink undertones. Fair 1.1N – Fair neutral. Fair 1.1P – Fair pink undertones. Light 1.2N – Light neutral. Light 1.2P – Light pink undertones. Light 1.2Y – Light yellow undertones. Light 1.2YG – Light yellow undertones with gold highlights. Light Medium 2.0N – Light medium neutral. Light Medium 2.0P – Light medium with pink undertones. Light Medium 2.0YG – Light medium with yellow undertones and gold highlights. Medium 2.1P – Medium with pink undertones. Medium 2.1Y – Medium with yellow undertones. Medium Dark 3.0R – Medium dark with red undertones. Medium Dark 3.0Y – Medium dark with yellow undertones. Dark 31.R – Dark with red undertones. Dark 3.1Y – Dark with yellow undertones. Deep 3.2N – Deep neutral. Deep 3.2R – Deep with red undertones. Very Deep 3.3N – Very deep neutral.